The best fall colors viewing in the Eastern Sierra starts in late September near Bishop, and generally continues through mid-October in area near the vicinity of Lee Vining. 1/125th of a second at f/8, ISO 200, 194mm on a Canon EOS 6D. I often compose images vertically, with a little extra room at the top and bottom, so they will work as book or magazine covers. 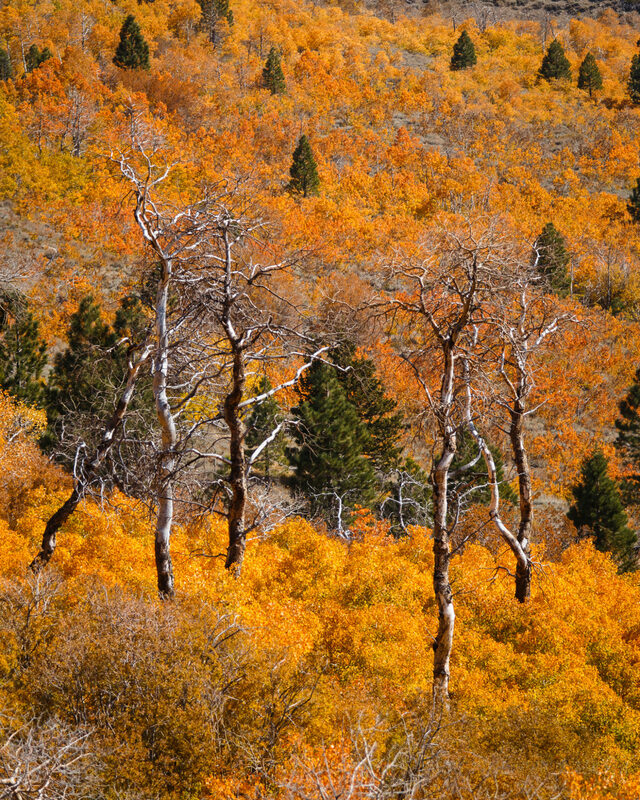 The fall colors in 2017 in the Eastern Sierra were somewhat disorderly, with early-turning trees that have already dropped leaves mixed with remaining green trees and peaking oranges and yellows. But that's more normal than not. Nature is inherently chaotic; it doesn't follow predictions, our desire for order. That's part of the adventure and reward of nature photography: the capacity for what you discover to exceed your preconceived expectations.